The wireless coin sized StickR TrackR device attaches to commonly misplaced items. Using an iPhone or Android app, the user can quickly locate their lost or misplaced items in seconds by causing the item to ring, using the app's hot & cold sensor, or via the last known GPS coordinates. Unlike regular GPS devices, TrackR uses a new form of GPS technology called Crowd GPS. When an item goes missing with a TrackR device attached, all TrackR enabled phones will begin to search for the item. If another user comes nearby the item, that user's phone will ping their server which will then update the item's owner with the new GPS coordinates. The more people in their network, the more real time the GPS updates will be and the better their devices will work. 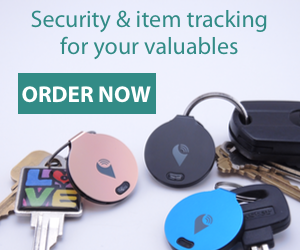 Track your bike, your dog, your keys, your car, or your phone in a flash with TrackR. Use your GPS to locate your treasured friend or your possessions and use a handy ringing feature for finding smaller items within any space. You can even set a separation alert so that if you're getting too far from your device, you get a notification. The TrackR is thin, durable, and is only $29.99 for a single unit. The more you purchase at once, the more you save. Give them as gifts or pocket them for your own stuff through the link below.